Tap to deal 1 damage to target flying creature. T Grapeshot Catapult deals 1 damage to target creature with flying. 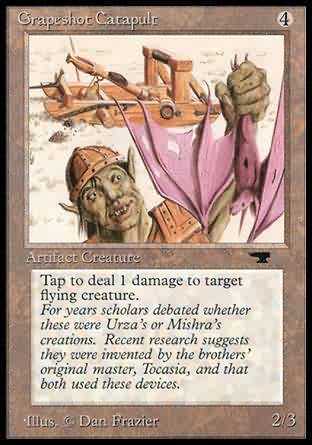 For years scholars debated whether these were Urza's or Mishra's creations. Recent research suggests they were invented by the brothers' original master, Tocasia, and that both used these devices.